There is limited water sources at the fields. Teams are responsible for their own teams hydration needs. Please clean up your bench area as you depart each game. There will be food vendors at all venues. Teams are welcome to bring their own coolers & food. NO grills and NO alcoholic beverages at any of the sites. Will be offered for sale at venues. We accept Visa, Mastercard, checks, and cash. Tourney stores will open at all locations at approximately 9AM. No pets are allowed at any of the fields at any of the facilities (on or off the fields). Portable team tents may be set up on fields or near players benches for temporary shade - however, NO permanent tents are permitted on the turf fields at any time. Please contact us at info@stickwithus.org if your team is interested in renting a 20 x 20 (or larger) permanent tent set up at the park for use thru the weekend. Fans and spectators will be asked to view the games from the sidelines opposite the team benches’ at all fields. Coaches ONLY on the team bench and players sidelines. All games played at the Sportsplex at Matthews - Matthews, NC - All games played on sports turf and all games guaranteed! 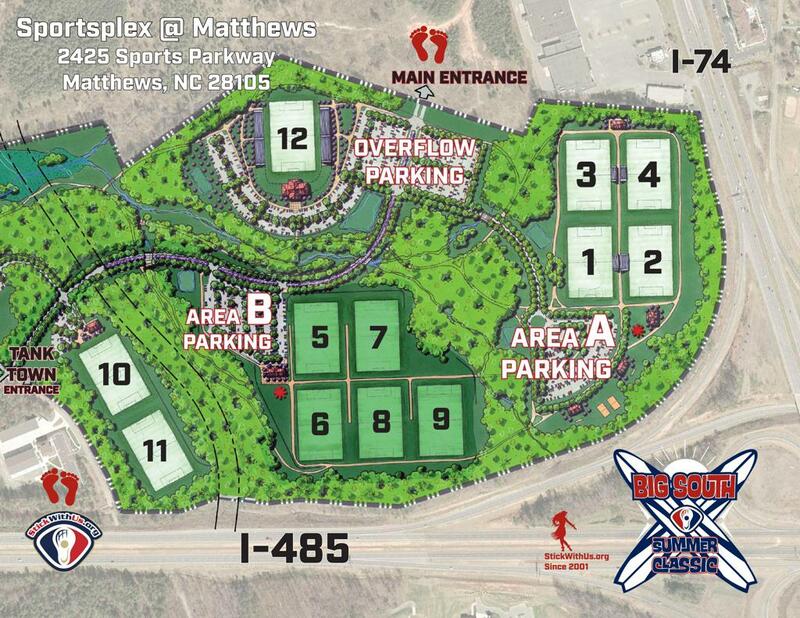 Newly renovated Sportsplex at Matthews features 11 turf fields & plenty of newly added parking!